Even by the most conservative estimate, people lived on these islands for more than five centuries before the arrival of European settlers. Another half century or so elapsed before the Treaty of Waitangi was signed and large-scale European colonisation began. Despite its vast length, though, the early history of Aotearoa/New Zealand gets short shrift in our media, our popular culture, and our political discourse. 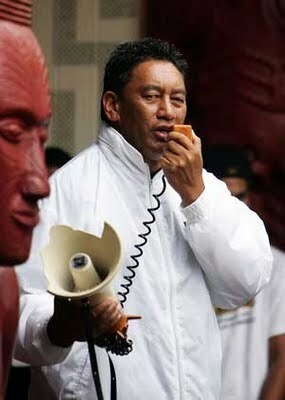 In an opinion piece published in the New Zealand Herald this week, Hone Harawira spends some time discussing pre-contact and early nineteenth century Maori society. Harawira's article is a reply to the anti-Maori rant Paul Holmes wrote for the Herald in the aftermath of Waitangi Day, and it offers an explanation for the signing of the Treaty of Waitangi in 1840, and an interpretation of the document's meaning. Hone's article is a lot easier and more interesting to read than Holmes' obnoxious and semi-literate tirade, but I found myself disagreeing with many of the arguments it makes about history. According to Hone, chiefs representing a Maori nation decided, after a fair amount of internal debate, to sign the Treaty in the hope that the document would allow them to create a partnership with the British Crown, and to maintain control over their rohe. As Hone goes on to observe, though, the Treaty did not prevent the Crown from waging war on Maori for decades, and alienating tens of millions of acres of Maori land. It is hard to read Hone's article without concluding that the Maori who signed the Treaty were at beast naive, and at worst downright foolish. The reality, though, is that neither a Maori nation nor British power existed in these islands in 1840. As Matthew Wright shows in his excellent new book Guns and Utu, iwi were not only often at war with each but internally fragmented in the 1830s, and British authority did not exist even in the Bay of Islands, where the religious and political representatives of the world's largest empire relied on the goodwill of Nga Puhi chiefs for their safety and keep. By 1840, iwi had interacted with small numbers of Pakeha for generations, and no idea that hordes of Britons might soon descend on their rohe, and by buying up swathes of land prompt the emergence of a sense of Maori nationhood, and nationalist organisations like the Kingitanga. The chiefs who signed the Treaty were not looking into the far-off future and making constitutional arrangements – they were pursuing short-term political and economic ends as they struggled with other Maori. Nga Puhi leaders, for instance, wanted the Treaty to cement their status as the most powerful iwi, by making sure that the Bay of Islands remained the locus for trade with Europeans. They were struggling to hold on to the advantages that Hongi Hika had gained with his new-fangled muskets in the 1820s, and trying to prevent the emergence of other areas of New Zealand as ‘hot spots’ for trade with Europeans. On the other hand, some Ngati Kahungungu leaders insisted on signing the Treaty because they thought it would shift the balance of power away from the north. 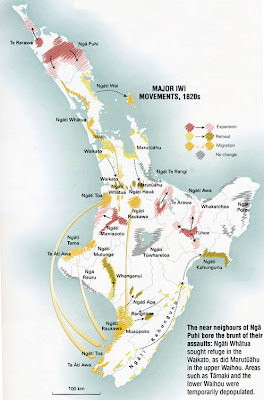 But Maori were not only divided into iwi: within tribes like Nga Puhi and Ngati Kahungungu there were dissident groups. Hongi Hika had been killed in 1828 not by one of the members of the many southern iwi he attacked, but by a dissident hapu of Nga Puhi who lived on Whangaroa Harbour, and who had refused to let him dictate their terms of trade with visiting European ships. With its constant struggles between and within iwi, Aotearoa was no more unified than Europe in the early decades of the nineteenth century. Hone's article for the Herald castigates Europeans not only for betraying the Treaty, but for forcing bibles, booze, and guns on Maori. These impositions, Hone suggests, helped destroy the harmony of pre-contact Maori society. Reading Hone's article, we would never guess that in the decades before 1840 iwi rapidly and eagerly transformed their economies, levelling forests and growing kumara and flax to exchange for muskets, cannons, and ammunition. Nor would we guess at the way Maori took up the Christian faith and reshaped it in the nineteenth century, as prophets like Papahurihia, Aperahama Taonui, and Te Kooti reinterpreted the bible in the light of their own experiences in Aotearoa. Hone Harawira has spent his life seeking greater autonomy for Maori. Again and again he has argued that iwi and hapu should be able to shape their own destinies, rather than remain submerged in Pakeha institutions. But Hone's vision of pre-contact and early nineteenth century Maori society denies that the indigenous people of these islands played any role in shaping their early history. Hone presents Maori society as undifferentiated and hostile to modernity, when it was divided and dynamic, and he sees Maori as the passive victims of innovations like the bible and guns, when in fact they seized upon and exploited these new features of their world in the nineteenth century. There's a curious similarity between Hone's take on the past of these islands and a polemical booklet by an obscure New Zealand communist named Ray Nunes. I've been discussing The Maori in Prehistory and Today, which Nunes wrote in the 1980s, with some members of the Workers Party of New Zealand, which has published the text on its website. As a socialist, Nunes was greatly attracted to what he saw as the classlessness of pre-contact Maori society. He was upset at the destruction of the 'primitive communism' of Maori society by nineteenth century colonisers. Nunes gave his booklet the subtitle The Great Unknown Past of the Maori People because he thought that contemporary anthropologists with a pro-capitalist agenda were deliberating obscuring this communist history. Nunes’ own understanding of anthropology was limited by his admiration for the Stalin-era Soviet Union. Under Stalin, Soviet anthropologists and ethnologists were forced to work within the confines of the categories that Engels used to describe prehistory in his 1884 book The Origin of Family, Private Property and the State. Engels believed that the American scholar Lewis Morgan had discovered, during his researches into the Iroquois people of North America, a series of stages through which prehistoric human societies typically passed. Morgan associated these stages, to which he gave the names Savagery, Barbarism, and Civilisation, with various forms of social organisation and with various technologies. Savage societies were devoid, for instance, of class distinctions, as well as pottery, while written language was a sign of civilisation. After he took control of the Soviet Union Stalin integrated the Morgan-Engels notion of a series of stages of prehistory into his mechanical vision of historical societies, which had feudalism being replaced inevitably by capitalism, which was in its turn replaced inevitably by socialism. History became a series of hoops that every society had to jump through. Stalin liked the stagist model of history because it seemed to make his rule unquestionable and his policies irreversible. When he forcibly collectivised Soviet agriculture, destroying Russia's peasantry, or made a shock alliance with Hitler on the eve of World War Two, Stalin was acting as the instrument of destiny. To oppose him was to stand on the wrong side of history. Outside the Soviet Union, though, the stagist model of the past had come under pressure early in the twentieth century, as scholars used new techniques like scientific archaeology and in-depth ethnographic research to gather evidence which showed that human societies were much more diverse than Morgan and Engels had imagined, and couldn’t be consigned to a series of tidy categories. It was clear that class distinctions did exist in many early societies, and that there were even hierarchies in some hunter gatherer societies. It was also clear that societies evolved in many different ways, and that different modes of production could co-exist in the same prehistoric society. Stalin prevented Soviet scholars from innovating in response to this new knowledge, but in several Western countries, most notably France, Marxist anthropologists reacted to it by abandoning the categories that Engels had laid out and instead adapting the complex method Marx had used in Capital to the study of pre-capitalist societies. This new materialist approach to prehistory began to influence scholars in New Zealand in the 1970s, but because he was trapped, even in the 1990s, in a Stalinist view of the world, Nunes knew nothing about the post-Stalin rebirth of materialist anthropology. If you take the trouble to read Engels’ summary of Morgan’s three stages of savagery and barbarism in Origin of the Family, you will not have much difficulty in seeing that pre-European Maori society was much too undeveloped to reach the highest stage of barbarism, and at best lies at the border between the middle and upper stages of savagery. The early Maori society was in many ways more highly developed than in most Pacific Islands still, it lacked certain essentials required to reach the middle or upper stage of barbarism, though their primitive agriculture along with advanced (for primitive society) methods of fishing, gives them some features of the lower stages of barbarism. What held the Maori back from further development towards slave society and civilisation was the difference between the natural endowments of New Zealand and the old world. Nunes’ claim that pre-contact Maori had a 'primitive' system of agriculture incapable of generating much of a surplus seems odd, in view of what we know about their horticultural achievements. Nunes lived for at least the last decades of his life in Auckland, a place that was, for at least a couple of hundred years, covered in a network of huge gardens. These gardens made use of all sorts of horticultural innovations, like artificial plaggen soils, specially designed wall systems which created microclimates, and networks of canals. Although Maori, like other Polynesians and like the indigenous peoples of North and central America, lacked metal tools and domesticated animals to help them work their lands, they made up for this lack by innovative use of wooden tools like the ko, and by the intensive deployment of human labour - including, in many cases, the labour of slaves. A fragment of Auckland's ancient gardens still exists, in the Otuataua stonefields reserve near the city's airport. Wandering around Otuataua's hundred or so hectares, one can easily see the extent to which Maori could use technology to modify the landscape and boost production. If Ray Nunes had visited the Otuataua stonefields, he would also have been able to see evidence for the existence of private property in pre-contact Maori society. At Otuataua and at other large garden sites around New Zealand, archaeologists have noted how walls and ditches were used not only for horticultural purposes, but also to demarcate the land which could be cultivated by individual whanau. Contrary to what Nunes claims, iwi tended to have concepts of private as well as collective ownership of land. The rich gardens of Auckland were one of the reasons the isthmus was so coveted by different iwi. There were so many battles over the place that it was given the name Tamaki a Makarau, or isthmus of one thousand lovers. Chiefs who took control of the gardens could produce and expropriate a surplus which could be ploughed into trade, war, and self-aggrandisement. Ray Nunes claims to have read Cook's accounts of Maori society, but he doesn’t seem to have noticed Cook’s many remarks about the sophistication of Maori agriculture, and the size of the surpluses this agriculture could produce. When he cruised along the western Bay of Plenty during his first visit to these islands, Cook called the Maori settlements he saw ‘towns’, and Joseph Banks thought that they might be the outposts of some great southern continent’s civilisation. Ray Nunes was forced to deny the sort of evidence I have been discussing because it conflicted with the stagist model of the past he had taken from Engels. Because Maori society lacked features like pottery and a written language Nunes felt that it must occupy the stage in human prehistory Morgan and Engels called 'Savagery'. By slotting Maori society into this pigeonhole, though, Nunes had to deny some very obvious features of that society, like sophisticated agriculture, the production of a surplus, and the existence of social stratification. At about the time Ray Nunes was working on his dogmatic booklet, the Hawaiian scholar Patrick Vinton Kirch was publishing The Evolution of the Polynesian Chiefdoms, a book which attempted to do justice to the diversity and fluidity of pre-contact Polynesian societies. Proceeding in the synoptic, materialist manner of the Annales school of historians and of French anthropologists like Godelier, Kirch's book compares the histories of all of the major Polynesian societies, including Aotearoa, and shows that Tonga, Hawa’ii and Tahiti had developed into highly stratified, economically advanced places by the seventeenth century, in contrast to islands like the Chathams and Pukapuka, where low-tech, egalitarian societies existed. Kirch advances a series of materialist explanations, including ecology, population pressure, and social conflict, to explain the development of stratification. Kirch argues that Aotearoa was less stratified than Tonga, Hawaii or Tahiti, but claims that significant divisions still existed between chiefs and commoners. Kirch's data suggests that two modes of production operated alongside each other in most of Aotearoa: a domestic subsistence mode, which was centred on the hapu, and a chiefly tributary mode, which relied on the communal labour of many hapu – on communally planted gardens, for example – and on tribute from hapu. The fluidity of pre-contact Maori society, where iwi would go in and out of existence, and both iwi and hapu would clash militarily, has been noted by many scholars, and this fluidity, which contrasts greatly with the stability of Tongan or Hawaiian society, probably has a lot to do with the fact that two partly contradictory modes of production existed side by side. Kirch's book is not without its critics, but it has become, for many anthropologists and archaeologists, a sort of framework within which detailed work on individual Pacific societies can be done. Kirch ought to be essential reading for anybody interested in a serious alternative to Ray Nunes' quixotic attempt at a materialist account of pre-contact Polynesian society. Ray Nunes might seem like a marginal, eccentric figure in New Zealand political and intellectual history, but I'd argue that his little book expresses, in admittedly old-fashioned, Eurocentric language, a vision of Maori history which is very common in the contemporary tino rangatiratanga movement and on the activist left in general. Like Hone Harawira's opinion piece for the Herald, Nunes' booklet presents traditional Maori society as undifferentiated, static, and incompatible with modernity: easy prey, in other words, for the colonisers of the nineteenth century. Because they see traditional Maori society as unstratified and essentially unchanging, rather than divided and highly dynamic, Hone and Nunes can't appreciate the speed with which Maori embraced aspects of the modern world in the early nineteenth century, the way iwi and factions within iwi used alliances with Europeans to further their own ends, and the canny, practical calculations behind the decisions of chiefs to sign the Treaty. Hone's article for the Herald and Nunes' booklet attempt to make us sympathise with early nineteenth century Maori by presenting them as a noble, simple people who were duped by Europeans and corrupted by modernity. This vision of history is not only patronising and disempowering - it is quite false. To do justice to the complexity of our past we need the scholarship of the likes of Patrick Vinton Kirch, not sentimental dogma. Why is it so hard to ascribe agency to our forebears? We seem to live our own lives striving for independence, personal meaning and making an individual mark on the worlds we live in but when it comes to our ancestors we can only conceive them as stereotypes and automatons. Uroroa was a chief at Kaeo/Whangaroa in the 1830s. He sold land to the first European settler, a former transported convict named William Spickman - convicted and latter pardoned of stealing a handkerchief from a gentleman leaving a Covent Garden theatre. Spickman married an Irish woman of good character named Mary Ann and built a small empire at Kaeo on the back of the kauri trade. When Mary Ann died, Spickman lived with one of Ururoa's daughters, fathered a second family with her, and after several decades decided to tie the knot. Prior to his second marriage, when Spickman's pre-Treaty claim was being adjudicated almost a decade after the purchase, the payment and the boundaries were confirmed and supported by Ururoa. Almost fifteen years later in the late 1850s when the first Crown Grant was voided, Ururoa again supported Spickman when the resurvey reduced his claim by 300 acres. This occured at a time of great economic, political and social consolidation amongst the Settler population, to the detriment in general of Maori. The Spickman/Ururoa story is probably pretty typical of the day, but doesnt fit with easy ideas of noble savages, cunning land speculators and a paradise lost. It never ceases to amaze me that despite the complications, rationalisations, excuses and contingent choices we make in our own lives, that we cant understand that likewise int he past, people made the best decisions for themselves according to their abilities, local possibilities, and the information they had to hand! I wish I could have said it as eloquently and concretely as you, Jono! Maybe you could get a contract as an advisor to Hone, when you're not clambering round the old pa sites of the north? This is exceptional, Scott, one of your best. Patrick Vinton Kirch has his enemies. Postmodernists for instance. But most acknowledge his preeminence in his field after 25 yrs research. Interesting bit of leftist trainspotter trivia: 'Ray' Nunes was Jewish. His real name was Raphael, but he did not use it for political purposes. As I said in the post, I've been reading Matthew Wright's book Guns and Utu: a short history of the Musket Wars. Wright's text complements rather than contradicts the previous major study of the subject, Ron Crosby's fat and sluggish Musket Wars. Crosby slogs through all of the major campaigns of the wars, so if you want a list of the folks whose eyes were pulled out and eaten by Hongi Hika on various battlefields, then he's the man to go to. Wright doesn't bother to run through the history of the wars in detail, but instead considers their meaning. Wright looks a lot at parallels between the Musket Wars and conflicts in other parts of the world in the nineteenth century, including Europe's Napoleonic wars and various campaigns in Africa, and this international perspective seems to help him escape some of the cliched ways twenty-first century Kiwis regard their past. Wright trashes the idea, so fashionable amongst liberals as well conservatives, that the Treaty of Waitangi was some sort of solemn constitutional agreement signed by forward-looking chiefs and Brit officials with their eyes on history. Wright has no time for the idea, increasingly fashionable amongst far right conspiracy theorists like John Ansell, that Maori asked for the Treaty to try to stop the Musket Wars - as he points out, the wars has largely petered out by 1840. Wright also disposes of the notion that the spread of Christianity helped end the wars, noting that many of the peace deals were made by pagans. Wright also has some interesting things to say about double barreled muskets. Nonsense. And in fact this post is now exhibit a of my campaign to hector NZ print media editors into fighting over your services. It's an ongoing scandal that this kind of writing - popular, informed, accessible, usefully provocative - is absent from our mainstream. Ditto to Gio's nonsense. I've said it on his blog, that he's one of the people I rate as most likely to provide the food for thought on how to understand these crazy times, even on economic matters. Economic anthropology is, IMHO, very likely to have a rapid rise in people taking an interest because even the blindest people are starting to see that mainstream economics isn't working at all. Not for any class except the shrinking upper class, and even for them, it's less productive than it could be. I've been reading Steve Keen recently, as classically trained Australian economist who is trying to rethink/rebuild economics from the ground up, and he most certainly takes an interest in the anthropology of economics, because it really is a source of some huge myths about the way money and other economic ideas work. Marxist economic analysis is being looked to more and more because it cuts back to fundamentals, although of course it's not the only set of ideas that does. I would like to say a few words about the Twentieth Congress of the Communist Party of the Soviet Union. I think there are two "swords": one is Lenin and the other Stalin. The sword of Stalin has now been discarded by the Russians. Gomulka and some people in Hungary have picked it up to stab at the Soviet Union and oppose so-called Stalinism. The Communist parties of many European countries are also criticising the Soviet Union, and their leader is Togliatti. The imperialists also use this sword to slay people with. Dulles, for instance, has brandished it for some time. This sword has not been lent out, it has been thrown out. We Chinese have not thrown it away. First we protect Stalin, and, second, we at the same time criticise his mistakes, and we have written the article On the Historical Experience of the Dictatorship of the Proletariat. Unlike some people who have tried to defame and destroy Stalin, we are acting in accordance with objective reality. scott, am genuinely surprised you haven't referenced 'A Show of Justice'. ward makes some good arguments about treaty being accepted as a means to provide rule of law in disputes between hapu. As I have previously written in published material, I consider Mao’s judgment of Stalin mostly correct. I don’t go round calling his penchant for repressing people who made errors and were treated as enemies, horrendous crimes. In my view, you are missing out on perceiving the whole picture of world development when you do this. You are in practice placing yourself alongside the imperialists, little as you might wish to. Mao’s judgment was that Stalin’s life was that of a great revolutionary despite everything, and that his positive achievements outweighed the negative features. To take the opposite position – as you tend to do, is fundamentally to discard Marxism-Leninism and socialist revolution because, who knows, it might lead to another Stalin who commits ‘horrendous crimes’, because he doesn’t see the road ahead clearly. When he was a leader of the Commuist Party of NZ Nunes also praised the 'free and open' Moscow trials. DONT WALL PAPER YOUR BEDROOM!! YOU ARE A THEORETICIAN ONLY!! Now, I got my own house years ago and three children successively either the porridge against the kitchen wall or used the sitting room wall as an art project! I cant recall what my ex said about it but I never took any (or much) notice...I think I just praised the "art", or the creative attempts! Or whatever it was children do with pencils and crayons on large flat surfaces!! A great poet - philosopher and ACADEMIC and author such as you cant afford to be weighed down by trivia such as wallpaper. Economists are not wrong to take classical theories [and more recent market or financial theories] of economics but it is true that a Marxist based economics, or some economy not dependent on free markets, private capital etc, does look ultimately a more efficient system. Perhaps less flexible in the short term. But within capitalism it is actually good for a country or society for example if credit is easily available (although the divisions between classes remain). It is still a very good idea to read that writing by Engels. I really enjoyed what he wrote and in implications of it...I don't think he proposes such a rigid structure as Stalin et al supposedly did...The rigid stages Nunes imagines (as Scott points out) are wrong or questionable, but a lot is very informative in Engels's social-political and philosophic writing. But they point toward future hopes and possibilities. The danger is to assume human beings have some kind of privileged position in Time above say the "position" of rats or bacteria. Scientists, anthropologists, philosophers, idealists, poets, Marxists: all fall into this Utopian dream-trap forgetting how brief in terms of deep time is our existence here. Who cares about ancient history? Be here now. Otuataua is very impressive, as are many of the older photos of garden areas before they were destroyed by quarrying and other land development. I have not visited Otuataua for some time. An archaeological trail was planned some time ago but no sensible signage was displayed on my last visit. I am intrigued by your mention of canals. I have seen what I believe to be medium diversions for fish traps. Beyond this I have often had the impression water flow was engineered here and there to preserve settlement areas or enhance lowland defensive positions but I have never encountered any references in the literature. Any pointers? n How Chiefs Became Kings, Patrick Vinton Kirch addresses a central problem in anthropological archaeology: the emergence of “archaic states” whose distinctive feature was divine kingship. Kirch takes as his focus the Hawaiian archipelago, commonly regarded as the archetype of a complex chiefdom. Integrating anthropology, linguistics, archaeology, traditional history, and theory, and drawing on significant contributions from his own four decades of research, Kirch argues that Hawaiian polities had become states before the time of Captain Cook’s voyage (1778-1779). The status of most archaic states is inferred from the archaeological record. But Kirch shows that because Hawai`i’s kingdoms were established relatively recently, they could be observed and recorded by Cook and other European voyagers. Substantive and provocative, this book makes a major contribution to the literature of precontact Hawai`i and illuminates Hawai`i’s importance in the global theory and literature about divine kingship, archaic states, and sociopolitical evolution. A compelling read, Scott. Thank you for a superb blogpost. Bill D.
Do you get this idea from other things that I've written on the internet, or just here, today? I'm not really a historical fatalist at all, I don't claim to know what's going to happen in the future. But I do believe one of the possible courses we could take relatively easily would be a lot better than other ones that seem likely. Finance has to be reigned in, at a barest minimum. I'm still not convinced Marxist economics doesn't suffer from the same fallacy that capitalist economics does, though, because it seems to always emphasize full employment. I do not ultimately believe full employment is either possible or even desirable. As the world becomes more technological, employment for monetary gain should become less and less necessary. The basics of human survival should be costing less and less, until a point is reached where no one is ever compelled to work just to subsist. Then only work that people actually want to do (for monetary gain, or out of pure interest) will be done. The basic right to a living income should be automatic, earned simply by being a human in a technologically developed society. If you want more than that, then you can work however you like. Unpleasant things would need to be reasonably well paid to get people to do them. Pleasant things would mostly be done because they are pleasant, although it would certainly be possible to make money doing them if you were really good. That's the end result that should happen, and the question is really about why it doesn't. If work is revered as a good in itself, rather than the outcome of the work being the good, then you get this strange setup we have whereby people are paid very poorly for the worst kinds of work, the most required work, typically, and get absolute fortunes for doing next to nothing of any use. So long as you suffered in your job, you have social worth, and enough to subsist on, in the worst case. This encourages people to be always protecting the very worst kinds of work, the least efficient, the most useless. So banking is seen a valuable job, and protects itself strenuously. Or a worker doing some manual job by hand is resistant to a tool that will make them more productive because it will cut the number of hours they need to work, which could do them out of a job. I don't have a deep class analysis in this view, although I am ultimately a socialist of sorts, I believe a society with a very small gap between the rich and poor groups is better. I'm a little undecided about whether it should still be possible to be filthy rich, though, so that probably means I'm not a Marxist? I guess I feel it should be possible to be rich and powerful, but only by being super awesome, and that it's so hard to be that awesome, that in the end no one would be. My ultimate view is that economic output would stop being the main criterion that social worth would be judged on anyway, and it would be about a far wider range of contributions - to the fullest limit of human potential. There are innacuracies obvious to the Maori or the Pakeha, but I do think some seious deconstruction needs to take place in respect of our histories and what political purposes they serve. Do you get this idea from other things that I've written on the internet, or just here, today?" No. I was just throwing ideas around. Interesting points you make here. my 'reading' of Otuataua was influenced by Ian Barber's essay on Maori canals and ditches, which he published in the New Zealand Journal of Archaeology in 1989. Barber differentiates waterways which were intended for irrigation from those which were boundary markers. I thought that some of the ditches at Otuataua resembled boundaries rather than irrigation channels - but I am an enthusiastic amateur, and I might have been letting my imagination get the better of me! I suppose I could fall back on the point that, even if the boundary ditches Barber discusses don't exist at Otuataua, they most certainly are found in other garden-systems around the country - the vast system near Kaitaia, for instance. I haven't been out to Otuataua recently but I understand that some more interpretation is in place. I'd like to do one of the guided tours DOC apparently organises. alas: I haven't read Alan Ward's book! I should have a look at his arguments about racial amalgamation, though, because I'm supposed to review Damon Salesea's new book from OUP, Racial Crossing. Howe's fine essay takes the young Judith Binney to task, but I think she came around to his point of view. "Why did you spend hours talking some old Stalinist"
scott, Ward is as important as Orange in its moderate reading of early NZL history. it's also highly influential among a specific generation of cold-war-era historians. the task of formulating and defending the serious that face their more enlightened peoples. The rest of us must abandon teenage morality and mind our own business. I would like to make contact with Jono. My aunt traced our maternal line back to William Spickman and I would like to find out more about him. Regretably my aunt has died and all the research she did seems to have disappeared. All I remember -- I was passing through NZ at the time -- is that one of the Spickman daughters married a Halliday which was where this all started.